"The heart of this unique one of a kind beaded necklace is pink Swarovski crystal rivoli. Decorated with a pink crystal tear drop. 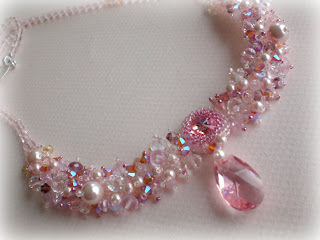 The beaded base of the necklace is embellished with many Swarovski crystals and Swarovski pearls in various shades of pink and clear crystal. However, this beaded jewelry is more than an awareness to a good cause. This necklace is simply drop dead gorgeous with truly dazzling effect. Whether you wear it to work or to an evening event, this necklace will make you the center of attention anywhere you go. The brightness of the exquisite Swarovski crystals will light your face and neck.As all of my jewelry, this necklace is delicate, elegant and outstanding, assuring you in the main center of attention anywhere you go. A gift full of beauty and meaning. October is the breast cancer awareness month. The Etsy Treasury Team is having a fund raiser to help find a cure for Breast Cancer. The proceeds from this sale will be donated to Holistic Center for Cancer Patients providing relief for patients and their families." (SpringColors). For more views of this stunner visit http://www.etsy.com/view_listing.php?listing_id=32329405. While you are there, browse other pieces by this talented artist. Please stop by every Saturday to see the latest "Featured Favorite". What a great piece for your first Featured Favorite. It truly deserves to be featured. I agree. Her breast cancer awareness necklace is so pretty (as is all her work)! Lovely necklace, and a generous act on your part Mary!